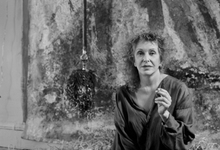 Carolee Schneemann (1939-2019), multidisciplinary artist. Transformed the definition of art, especially discourse on the body, sexuality, and gender. 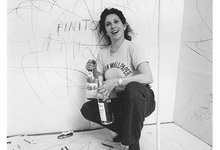 The history of her work is characterized by research into archaic visual traditions, pleasure wrested from suppressive taboos, the body of the artist in dynamic relationship with the social body. Painting, photography, performance art and installation works shown at Los Angeles Museum of Contemporary Art; Whitney Museum of American Art; Museum of Modern Art, NYC; Centre Georges Pompidou, Paris; and most recently in a retrospective at the New Museum of Contemporary Art in New York entitled Up To And Including Her Limits. Film and video retrospectives at Centre Georges Pompidou, Paris; Museum of Modern Art, NY; National Film Theatre, London; Whitney Museum, NY; San Francisco Cinematheque; Anthology Film Archives, NYC. 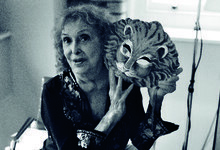 She taught at many institutions including New York University, California Institute of the Arts, Bard College, the School of the Art Institute of Chicago. Recipient of a 1999 Art Pace International Artist Residency, San Antonio, Texas; Pollock-Krasner Foundation Grant (1997, 1998); 1993 Guggenheim Fellowship; Gottlieb Foundation Grant; National Endowment for the Arts Fellowship. Honorary Doctor of Fine Arts, Maine College of Art, Portland, ME. Lifetime Achievement Award, College Art Association, 2000. 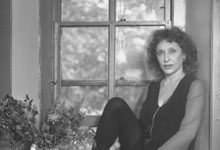 Schneemann published widely; books include Cezanne, She Was A Great Painter (1976), Early and Recent Work (1983); More Than Meat Joy: Performance Works and Selected Writings (1979, 1997).